Sir Kyffin Williams - A Welsh Pony refusing to be led - Online gallery supplying original fine art. Trending Modern British and Contemporary Welsh. TWO FOR THE PRICE OF ONE!! Available for sale from Big Sky Fine Art; this original painting and drawing by Sir Kyffin Williams. The paper has another drawing by the artist on the reverse of a farmer standing with a stick by a stone wall.<br> The watercolour and drawing are presented and supplied in a contemporary frame. The framing has been performed to make both images visible with preference given to the watercolour of the Pony.<br> The watercolour is signed with a monogram lower right.<br> <br> Sir John "Kyffin" Williams, KBE, RA is regarded as one of the great figures of Modern Welsh art. His iconic paintings of the North Welsh landscape and the people that lived and worked there have become enduring and instantly recognisable images. His energetic contribution to the artistic life of Wales has done much to enhance its sense of distinctive cultural identity, and his influence is today felt far beyond his homeland.<br> <br> John Williams, as he was known as a child, was born on 9th May 1918 in Llangefni, Anglesey into an old landed Anglesey family. His father was a bank manager. Both of his parents were children of Church of England rectors on the island. The country parishes, farmland and stone walls that defined his early life were later to define his drawings. Together with his elder brother Richard, John was sent away to prep school at Moreton Hall, then Shrewsbury School, where he contracted polioenecephalitis which later led to the onset of epilepsy. For three years he held a job as a land agent with a firm in Pwllheli. Then in 1937 he joined the 6th Battalion Royal Welch Fusiliers as a lieutenant. At the outbreak of war, he was sent to Northern Ireland, but four years later he failed a British Army medical examination because of epilepsy, and his doctor advised "As you are, in fact, abnormal, I think it would be a good idea if you took up art. "<br> <br> He adopted his grandmother’s maiden name, Kyffin (rhymes with puffin!) as a more painterly name. Despite early academic difficulties, Williams enrolled at London's Slade School of Fine Art in 1941. During the war the School was based as the Ashmoleum Museum in Oxford. At interview he was told by an old professor that he couldn’t draw and could attend for one term only! In fact, he stayed for three years and the young Kyffin who had arrived drawing nudes that his tutors had told him looked more like trees ended up winning the Slade Portrait Prize and the Slade Leaving Scholarship. He found in art a way of conveying compassion and knew that he had found his true vocation. He was fascinated with Van Gogh, and felt an affinity, not least because they were both epileptic.<br> <br> Williams went on to teach art at Highgate School, London, where he was senior art master from 1944 until 1973.This provided him with the perfect base to develop his highly characteristic work, “free from the pressures of fashion and the contagious influences of art schools”. His pupils included the historian Sir Martin Gilbert, Royal Academicians Anthony Green and Patrick Procktor and composers John Tavener and John Rutter. <br> <br> In 1948, his first exhibition at the prestigious Colnaghi's marked an already auspicious start; he showed there twice again and frequently at the Leicester Galleries and thereafter in several prominent Welsh galleries. <br> <br> In 1968 he won a scholarship (Winston Churchill Fellowship) to study and paint in Y Wladfa; the Welsh settlement in Patagonia, where he produced works of an unusually vibrant colour. In February 2011 it was announced that Williams' paintings of Patagonia would be shown for the first time.<br> <br> Throughout his London teaching years, Kyffin's heart remained in Wales, and he returned to paint at every opportunity. In 1973 he returned to his beloved Wales for good and settled back on Anglesey in a house overlooking the Menai Strait, which remained his home for the rest of his life.<br> <br> As an artist Williams typically drew inspiration from the Welsh landscape and farmlands. The north Wales of his upbringing, the mountains that he had roamed, first as a boy with his dog, later walking with the hounds, demanded to be drawn or painted. His infamous palette knife technique has been imitated but never equalled by a whole generation of artists that followed him.<br> <br> Williams painted in a fast and furious manner, was fanatical about structure and form and described his production of art in terms of military engagement; he "did battle" with a picture and being "defeated" by it made him miserable.<br> The darkness implicit in so many of Kyffin's mountain landscapes was a facet of his own make-up. He recognised in it the Celtic tendency to melancholy, but believed it to be exacerbated by circumstance, instinctively feeling that a certain despair and gloom were the logical sequel to his grand mal seizures. So the ostensibly calm exterior - army officer bearing, country gentlemanly tweed suits, aristocratic nose, luxuriant moustache - hid a more complex personality. <br> <br> He became President of the Royal Cambrian Academy and in this role immersed himself in projects which arguably made as important a contribution to artistic life in Wales as his painting. He inspired a revitalisation of the Academy and its transfer to a splendid new gallery in Conwy. <br> <br> Other Welsh galleries were similarly indebted to him and he was instrumental in securing for Anglesey the drawings of wildlife artist Charles Tunnicliffe and, in turn, a gallery to house them. He had strong relationships with the National Library of Wales in Aberystwyth and gave long service to several art committees, recognising and encouraging the acquisition of works by other now prominent artists, such as Gwen John.<br> <br> His talent and service to the arts was well recognised; in 1974 Williams was appointed a member of the Royal Academy. In 1995 he received the Glynd&#373;r Award for an Outstanding Contribution to the Arts in Wales during the Machynlleth Festival. He was awarded the OBE for his services to the arts in 1982 and a Knighthood in 1999.The Oriel Kyffin Williams gallery was opened during the summer of 2008. The Kyffin Williams Drawing Prize was established, and was awarded for the first time during 2009. <br> <br> Although most known for his landscapes Williams was a fine and sensitive portrait painter and undertook commissions for many prominent pillars of Welsh society. It is said that there is hardly a public institution in Wales which does not have at least one Kyffin picture in its boardroom.<br> <br> Also an accomplished writer, Williams published two volumes of autobiography, Across the Straits (1973) and A Wider Sky (1991). He once described himself as "an obsessive, depressive, diabetic epileptic, who's apprehensive, selfish, intolerant and ruthless". This was something of a harsh assessment of a man considered immensely lovable and charming, and a great raconteur. <br> <br> Despite many loves and engagements Kyffin never married, quoting the difficulties of his epilepsy and its stigma. Not having his own wife and family pained him, but he did enjoy the company of a vast number of friends. Not least of these were the Marquis and Marchioness of Anglesey who were generous and supportive of his art.<br> <br> By his twilight years the art of Sir Kyffin Williams had truly captured the imagination of the Welsh public. His dark, monumental landscapes of Snowdonia came to be regarded as having an iconic status, and so too did the man himself. He came to be known affectionately simply as “Kyffin”. But, as a Royal Academician since 1974, his work was also familiar far beyond Wales and, of late, much sought after. <br> <br> Today Kyffin's works command huge prices and are held in many public collections, including the Government Art Collection, the Arts Council Collection and the National Museum of Wales.<br> <br> Kyffin Williams died on 1 September 2006, aged 88, at a nursing home in Anglesey. He had been suffering from lung cancer, believed to be a result of working with lead-based paints. He was buried at St Mary's Church, Llanfair-yng-Nghornwy. Paying tribute to Williams after his death, bass-baritone singer and Williams collector Bryn Terfel said, "I'm deeply saddened by the passing of Wales's foremost ambassador in the visual arts. Long may his memory live on in the legacy of his numerous, wonderful paintings.”<br> <br> Later in 2006, the Welsh singer and Manic Street Preachers front-man James Dean Bradfield included a track called "Which Way to Kyffin", dedicated to Williams, on his album “The Great Western”.<br> <br> A definitive biography of Kyffin’s life entitled “Obsessed”, by David Meredith and John Smith, was published in 2012. John Smith comments “The old adage that success in Wales is signified by a Volvo on the drive, a house in Pontcanna, and a Kyffin on the wall, always made him laugh,”. He added<br> “Kyffin’s epilepsy and associated depression taunted him for much of his life, but ironically, he showed the way for many individuals with similar disabilities. 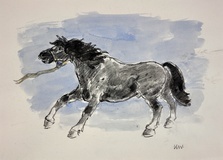 He is truly iconic, in the best sense of the word.”<br> <br> This charming original watercolour depicts a black/grey pony with a halter around his neck. He is clearly not in the mood to be led anywhere and he is standing firm, pushing backwards with his front legs. It is a lively and light-hearted piece. The pony looks playful rather than cantankerous; his eyes are bright and his thick black mane is flowing and free. Under his chin there appears to be a blue rosette. Has this naughty pony already won something in the local show? Not for obedience, we think!<br> There is a pale blue colour-wash in the background. Your purchase will arrive as described. TWO FOR THE PRICE OF ONE!! Available for sale from Big Sky Fine Art; this original painting and drawing by Sir Kyffin Williams. The paper has another drawing by the artist on the reverse of a farmer standing with a stick by a stone wall. The watercolour and drawing are presented and supplied in a contemporary frame. The framing has been performed to make both images visible with preference given to the watercolour of the Pony. The watercolour is signed with a monogram lower right. Sir John "Kyffin" Williams, KBE, RA is regarded as one of the great figures of Modern Welsh art. His iconic paintings of the North Welsh landscape and the people that lived and worked there have become enduring and instantly recognisable images. His energetic contribution to the artistic life of Wales has done much to enhance its sense of distinctive cultural identity, and his influence is today felt far beyond his homeland. John Williams, as he was known as a child, was born on 9th May 1918 in Llangefni, Anglesey into an old landed Anglesey family. His father was a bank manager. Both of his parents were children of Church of England rectors on the island. The country parishes, farmland and stone walls that defined his early life were later to define his drawings. Together with his elder brother Richard, John was sent away to prep school at Moreton Hall, then Shrewsbury School, where he contracted polioenecephalitis which later led to the onset of epilepsy. For three years he held a job as a land agent with a firm in Pwllheli. Then in 1937 he joined the 6th Battalion Royal Welch Fusiliers as a lieutenant. At the outbreak of war, he was sent to Northern Ireland, but four years later he failed a British Army medical examination because of epilepsy, and his doctor advised "As you are, in fact, abnormal, I think it would be a good idea if you took up art." He adopted his grandmother’s maiden name, Kyffin (rhymes with puffin!) as a more painterly name. Despite early academic difficulties, Williams enrolled at London's Slade School of Fine Art in 1941. During the war the School was based as the Ashmoleum Museum in Oxford. At interview he was told by an old professor that he couldn’t draw and could attend for one term only! In fact, he stayed for three years and the young Kyffin who had arrived drawing nudes that his tutors had told him looked more like trees ended up winning the Slade Portrait Prize and the Slade Leaving Scholarship. He found in art a way of conveying compassion and knew that he had found his true vocation. He was fascinated with Van Gogh, and felt an affinity, not least because they were both epileptic. Williams went on to teach art at Highgate School, London, where he was senior art master from 1944 until 1973.This provided him with the perfect base to develop his highly characteristic work, “free from the pressures of fashion and the contagious influences of art schools”. His pupils included the historian Sir Martin Gilbert, Royal Academicians Anthony Green and Patrick Procktor and composers John Tavener and John Rutter. In 1948, his first exhibition at the prestigious Colnaghi's marked an already auspicious start; he showed there twice again and frequently at the Leicester Galleries and thereafter in several prominent Welsh galleries. In 1968 he won a scholarship (Winston Churchill Fellowship) to study and paint in Y Wladfa; the Welsh settlement in Patagonia, where he produced works of an unusually vibrant colour. In February 2011 it was announced that Williams' paintings of Patagonia would be shown for the first time. Throughout his London teaching years, Kyffin's heart remained in Wales, and he returned to paint at every opportunity. In 1973 he returned to his beloved Wales for good and settled back on Anglesey in a house overlooking the Menai Strait, which remained his home for the rest of his life. As an artist Williams typically drew inspiration from the Welsh landscape and farmlands. The north Wales of his upbringing, the mountains that he had roamed, first as a boy with his dog, later walking with the hounds, demanded to be drawn or painted. His infamous palette knife technique has been imitated but never equalled by a whole generation of artists that followed him. Williams painted in a fast and furious manner, was fanatical about structure and form and described his production of art in terms of military engagement; he "did battle" with a picture and being "defeated" by it made him miserable. The darkness implicit in so many of Kyffin's mountain landscapes was a facet of his own make-up. He recognised in it the Celtic tendency to melancholy, but believed it to be exacerbated by circumstance, instinctively feeling that a certain despair and gloom were the logical sequel to his grand mal seizures. So the ostensibly calm exterior - army officer bearing, country gentlemanly tweed suits, aristocratic nose, luxuriant moustache - hid a more complex personality. He became President of the Royal Cambrian Academy and in this role immersed himself in projects which arguably made as important a contribution to artistic life in Wales as his painting. He inspired a revitalisation of the Academy and its transfer to a splendid new gallery in Conwy. Other Welsh galleries were similarly indebted to him and he was instrumental in securing for Anglesey the drawings of wildlife artist Charles Tunnicliffe and, in turn, a gallery to house them. He had strong relationships with the National Library of Wales in Aberystwyth and gave long service to several art committees, recognising and encouraging the acquisition of works by other now prominent artists, such as Gwen John. His talent and service to the arts was well recognised; in 1974 Williams was appointed a member of the Royal Academy. In 1995 he received the Glyndŵr Award for an Outstanding Contribution to the Arts in Wales during the Machynlleth Festival. He was awarded the OBE for his services to the arts in 1982 and a Knighthood in 1999.The Oriel Kyffin Williams gallery was opened during the summer of 2008. The Kyffin Williams Drawing Prize was established, and was awarded for the first time during 2009. Although most known for his landscapes Williams was a fine and sensitive portrait painter and undertook commissions for many prominent pillars of Welsh society. It is said that there is hardly a public institution in Wales which does not have at least one Kyffin picture in its boardroom. Also an accomplished writer, Williams published two volumes of autobiography, Across the Straits (1973) and A Wider Sky (1991). He once described himself as "an obsessive, depressive, diabetic epileptic, who's apprehensive, selfish, intolerant and ruthless". This was something of a harsh assessment of a man considered immensely lovable and charming, and a great raconteur. Despite many loves and engagements Kyffin never married, quoting the difficulties of his epilepsy and its stigma. Not having his own wife and family pained him, but he did enjoy the company of a vast number of friends. Not least of these were the Marquis and Marchioness of Anglesey who were generous and supportive of his art. By his twilight years the art of Sir Kyffin Williams had truly captured the imagination of the Welsh public. His dark, monumental landscapes of Snowdonia came to be regarded as having an iconic status, and so too did the man himself. He came to be known affectionately simply as “Kyffin”. But, as a Royal Academician since 1974, his work was also familiar far beyond Wales and, of late, much sought after. Today Kyffin's works command huge prices and are held in many public collections, including the Government Art Collection, the Arts Council Collection and the National Museum of Wales. Later in 2006, the Welsh singer and Manic Street Preachers front-man James Dean Bradfield included a track called "Which Way to Kyffin", dedicated to Williams, on his album “The Great Western”. 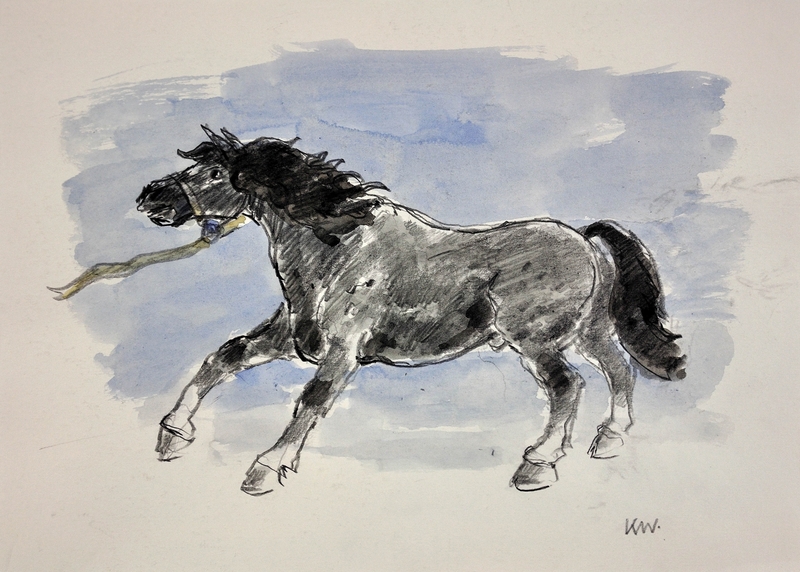 This charming original watercolour depicts a black/grey pony with a halter around his neck. He is clearly not in the mood to be led anywhere and he is standing firm, pushing backwards with his front legs. It is a lively and light-hearted piece. The pony looks playful rather than cantankerous; his eyes are bright and his thick black mane is flowing and free. Under his chin there appears to be a blue rosette. Has this naughty pony already won something in the local show? Not for obedience, we think! There is a pale blue colour-wash in the background. Send us your details and we'll be back in touch about this artwork.